Your Horse is Your Mirror – is a phrase that I have heard bandied around in horsemanship circles over the years but I think that most people don’t really know just how true that is and to what depths that concept actually goes. As my horsemanship has evolved, there has been a deepening awareness about the spiritual role that horses play as it becomes more and more apparent just how much their behavioural, emotional and physical issues are a mirroring of us (their owners), the people around them, the environment and a way of getting messages across to us. Not just messages about how they should be ridden or worked with, but messages about the deepest aspects of ourselves – our soul. Even many of their physical problems and health issues are a mirroring or a message for us. This awareness began about 15 years ago when I began working with one of my greatest mentors Tony Robinson. He helped me work with horses when no amount of training and no training method or technique would fix them, but energetic and emotional clearing work on them and or the people associated with them, transformed them in an unbelievably quick time frame and sometimes instantly. Progress made via horse “training” happens relatively slowly – degree by degree or millimetre by millimetre or sometimes it can get to the point where no progress is being made at all, or it is like one step forward and one step back – whether this is changes in their body or their mental ability to learn, their emotional state or their physical ability to do something. Changes that come through spiritual, energetic or emotional healing or clearing are usually fast in comparison – often overnight and sometimes even instantly – sometimes seeming miraculous. It is like things just jump 10, 20, 30, 40 or even more steps ahead. Some times the changes can take a while to process through the body in which case we need to allow the horse and ourselves time and space for the processes to occur. It is the instantaneous, or overnight changes, that I have seen many, many times now that prove to me the power of the deeper spiritual, emotional and energetic aspects of horsemanship. Things like a horse being unrideable one day (it is going to buck you off or it did buck you off) and then with no “training” to fix the problem the next day is soft and you can just hop on and ride. Or things like colic – in the last clinic that I taught, there were three cases of horses having colic which instantly healed the moment we got the messages that the horses were trying to convey to people. The horses simply got up and walked away the moment we got the messages. This year these experiences have been escalating and amplified – the horses are drawing my attention to this aspect of horsemanship again. For many years now I have been teaching the concept that “Horsemanship is more about a way of “Being” than it is about a way of “Doing”. Meaning that how we are on the inside – our thoughts, intentions, attitudes and emotions – are the most important aspects of horsemanship. Our thoughts, intentions and emotions dictate our body language and how we can use our body in terms of freedom, mobility, balance and co-ordination. Our way of being is more important than what we do because our way of “being” determines the quality of our “doing” – the quality of the feel, timing and balance we have. For quite some time I have been teaching about the mirroring that occurs between horse and human and how horses can be influenced to improve their posture and self-carriage just with us holding the intention and the feeling in our body of what we want them to do in their body. When I first discovered this I was pretty astounded, as are many of my students when I teach them this concept. This way of influencing the horse can happen even when you are working on the ground at liberty, meaning when there is no lead rope attached and no physical contact. This demonstrates just how much our thoughts, intentions, emotions and body language affect the horse. So this deeper level or next evolution of horsemanship of horses mirroring us or communicating to us about our way of Being (the thoughts and emotions that we carry) is not a different tangent or a new concept but just a deepening evolution of what I have already found to be true. My teaching has focused a lot on developing this way of “Being” which I gave a name, calling it being “centred”, taken from Martial arts and in particular Aikido. When we are in our centre we have the qualities of mental and emotional calmness and stillness, intuition, non-reaction and non-judgment along with physical power, strength and balance. You can read more about being centred in another article that I have written. Learning how to centre yourself and being able to get yourself back to being centred when you come out of that state, is very important. I now refer to that as a “management strategy” – it is how you manage yourself in the moment as you are “doing” what you do. All who have done my courses will know the absolute importance of being centred – it is a critical element for success – it calms the mind and emotions of both the horse and the human and it is the cornerstone for correct biomechanics and top level athleticism as it puts the body in a physical state of balance and power. The next evolution of this learning about our way of Being is what I think of as “the cure” as opposed to the “management strategy”. When we look at “the cure” we are looking at what is stopping the centred state being our default state all of the time, what is causing us to keep coming out of our centre and what is stopping us from becoming even more deeply centred. The answer to these questions is our mind and emotions. It is the negative memories and restrictive emotions, perceptions or beliefs that we carry, often in our subconscious, that continually shift us out of the centered state ( state of calmness, presence, relaxation and balance) and prevent it from being our default state. So in saying all of that, it seems that the golden key to improving our horsemanship, as well as all other areas of our lives, is learning to discover what these memories, emotions, perceptions and beliefs are that are restricting us and clearing them. The horses are trying to show us what these restrictions are through their behaviour, way of moving or through their health and soundness. 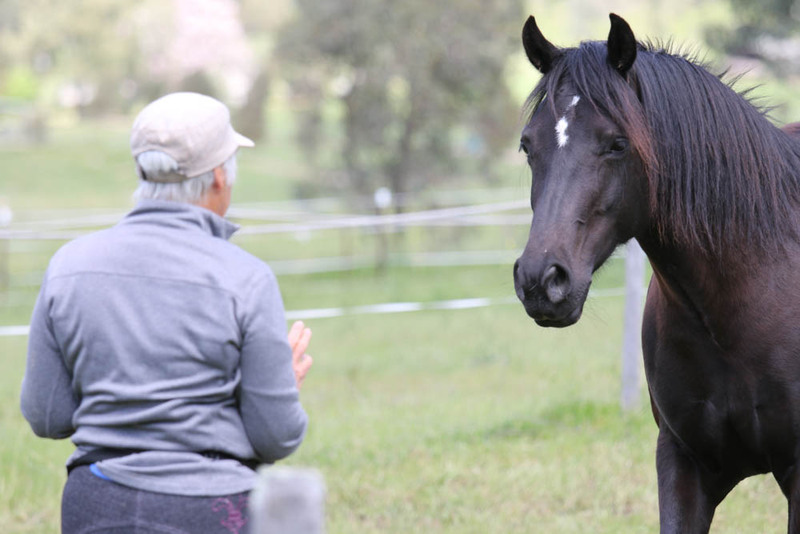 These restrictive memories, thought patterns and emotions affect our horses, because just as our thoughts and intentions and our positive way of being centred affect the horses positively, the underlying memories and emotions that we carry, many of which are in our subconscious, affect the horses negatively. Horses are feeling us energetically at the deepest level, they feel and see through the surface and under the facade and they show us what is hiding underneath. They are mirrors reflecting back to us. 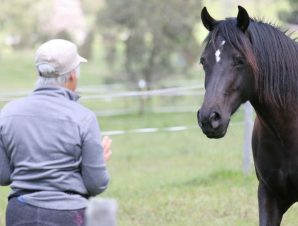 This is why horses can be used so successfully in Equine Facilitated Psychotherapy, but they don’t just save these talents for scheduled psychotherapy sessions, this is how they are operating all the time in all of their human interactions. The restrictive thoughts and emotions that we carry block us, confuse us, cause conflict within us and sabotage what we are trying to achieve in our lives. They stop us from moving forward and finding success and true happiness in our lives. These thoughts and emotions tighten and restrict our bodies making us stiff, rigid, unbalanced and reactive even to the point of affecting our health and making us sick. All of this affects our feel and our ability to ride with balance, fluidity and in synchronicity with the horse. I have known for many years that the only way to really help people ride well, was to be able to help their mind and emotions relax and become calm and still as only then can their physical bodies let go and relax, allowing them to be balanced and have feel and fluidity of movement. When we are weighed down with a lot of emotional baggage our horses can take on these burdens and they become affected emotionally and physically. Other animals also do this. Animals will take on our fear, anger, depression, sadness or whatever emotion it is that we are carrying and they themselves become fearful, angry or depressed for example and their behaviour in training or in the paddock will demonstrate this. Behaviours we don’t want such as bucking, biting, rearing, won’t go forward, going forward too much, not stopping or not loading on the float are just a few examples of things horses will do as they express this emotion or to communicate to us and show us what it is within us that we need to address. Horses start communicating in subtle ways but when we don’t get the message or don’t take appropriate action things escalate until we pay attention. These emotions when left unaddressed can manifest into health and unsoundness issues in the body, whether our body or the horse’s. The horses may get sick, have colic or their muscles and tendons stiffen up, joints develop arthritis, the nervous system gets tight and tense and they run on adrenaline or they become shut down. These are just a few examples. These emotional and physical issues start changing the horse’s posture causing postural problems – things like ewe necks, cow hocks, pigeon toes, narrow chests or disengaged pelvises and hollow backs for example. These things then affect the horse’s way of moving and the ease and comfort with which they can move. Their energy levels are affected and all of this affects their ability and willingness to do as we ask when ridden or in groundwork. Of course bad riding and badly fitting saddles can also cause the above and these areas are still very important to consider. There is still an importance on learning good riding techniques and ground skills but it needs to be in the context of this deeper understanding of horses. When we start to acknowledge the consciousness of horses and the spiritual work that they are doing in helping us to clear ourselves of what is holding us back from being our truly authentic selves and reaching our highest potential, it puts a whole new perspective on horsemanship. Horses can be our guides or the pathway for spiritual evolution and enlightenment. For me this is horsemanship in its truest and highest form – this is when we are truly understanding horses and what they are communicating. This is truly the path for those who are looking to work with horses in a state of harmony and lightness rather than force. As we better ourselves, spiritually, emotionally, mentally, physically and energetically, the resistance or issues in the horses simply go away and we can have enjoyment and success with horses in the form of riding and performance if that is our desire and have horses that are happy and willing to do it.